It really was the name of the dish that caught my attention: La Bamba. With a name like that, how could it not be delicious? I just had to try it. And let me tell you, it did not disappoint. Instant “Keeper” status was achieved. So good in fact that not only one, but two teenagers with most discriminating Irish taste buds have amazed their mom by requesting this dinner. It is still puzzling to me that something this easy to put together, can really taste so good. 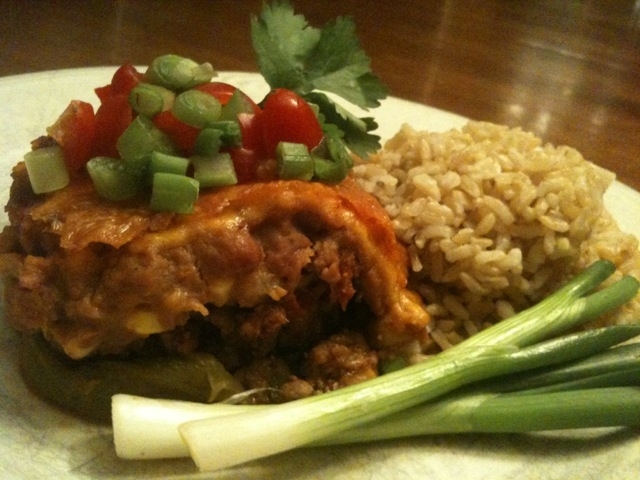 Layer upon layer of Mexican goodness all under the cover of a crusty canopy of melted cheddar cheese. What a perfect dish to bring to a party or to a friend who is sick. What could be better? What I really like about this recipe is it’s one really meant to be made your own. You don’t like chopped tomatoes, then top with sliced black olives instead. Want it spicier, add a dash of cayenne. Don’t like refried beans, substitute some organic black beans. Serve it with a side of brown rice, tortilla chips or eat it all alone. It’s entirely up to you. Let your own taste buds be your guide. Take a chance. It won’t let you down. So whether you like yours with a kick of cayenne pepper or smokey paprika, make this one your own because it is heaven in an 8×8 glass dish. If you have the gumption make it a mission to find whole fire-roasted green chilis in a can rather than diced to form the bottom layer of this dish. I find it is the trick to holding the casserole together. Place whole green chilis on bottom of greased 8×8 square glass baking dish. Next heat onion, garlic, salt, cumin, chili powder in saute pan with 1 tablespoon olive oil. Cook for a few minutes until onions begin to soften. Add ground turkey and cook until it crumbles. Add Rotel tomatoes. Mix well and cook about 5 minutes until liquid evaporates. Spoon seasoned turkey mixture over chili layer in square pan. Top with thawed corn. Carefully spread the refried beans over corn. Sprinkle shredded cheddar over beans. Bake at 375 degrees for 30 minutes or until cheese is golden brown. Let stand for 5 minutes and top with tomatoes and green onions. Serve with brown rice or tortilla chips. Note: I like to add a dash of cayenne pepper to the ground turkey when sauteing with the onions, but I like it spicy. Sometimes for variety I use Archer Farms (a Target Brand) Ancho Chili powder and a dash of Penzey’s smoked Paprika. *Note: I’ve increased this amount from the original Cooking Light Recipe). Photo by suebthefoodie. © suebthefoodie.com, 2011. Orignal recipe found in Cooking Light Magazine and given to me by T.O. M. R.
Loved finding your comment on here my dear friend. I love this recipe and love making it for you. Glad to know you enjoy.